The double spiral staircase is one of the most dramatic features of Chambord Castle - as the guests were told in their program, it may well have been designed by Leonardo da Vinci! Of course we had to do a portrait here! Instead of a more traditional full length shot of the bride standing, we asked her to sit on one of the banisters arches surrounding the staircases. This allowed more of her veil and dress to be seen - the softness of the bride a nice contrast to the stone structure. 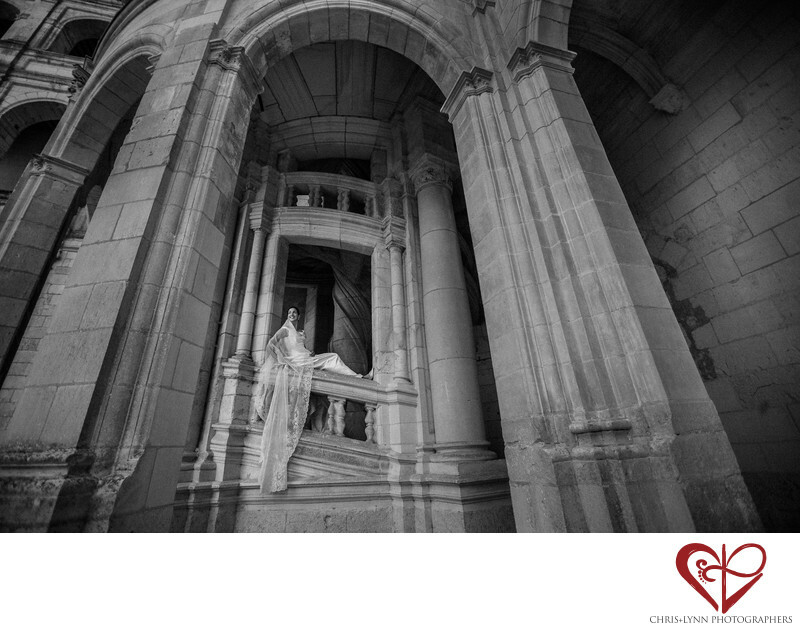 Using the Canon 16-35mm wide angle lens allowed Chris to show off the beauty of the bride and her dress as well as the grand scale of the French Renaissance architecture.